The Japanese betrothal ceremony, called the yuino, is an exchange of symbolic gifts between the groom's and bride's families. Some popular gifts are: konbu, a seaweed whose name can be written to mean "child-bearing woman"; a long white piece of hemp, representing a wish that the couple will grow old and gray together; and a folding fan, which spreads to show future wealth and growth. The main gift is money (about $5, 000), tucked in a special envelope called a shugi-bukuro, which has gold and silver strings that are impossible to unknot. The other gifts are given in ornate rice-paper envelopes. The traditional Japanese ceremony is a Shinto ceremony, though many Japanese in America celebrate weddings with a Buddhist ceremony. Regardless of religious rituals, most Japanese also include a cultural sake-sharing tradition at the wedding, popularly called san-san-kudo - san means "three, " ku means "nine, " and do means "to deliver." This ritual dates back to a time when sharing sake created a formal bond as strongly as a handshake did in Victorian times. Using three flat sake cups stacked atop one another, the bride and groom take three sips each from the cups. Then their parents also take sips (for a total of nine sips), cementing the bond between the families. Japanese weddings usually take some time to acknowledge the parents of the bride and groom. In some weddings, the couple offers bouquets of flowers, a toast, or a personal letter of love and thanks. Any of these gestures is a beautiful way to honor your parents at the wedding. Wedding speeches and blessings are very important at Japanese weddings. Family, friends, colleagues, and teachers all stand up at one point or another to wish the couple well. Traditionally, these speeches might be moralistic tales about matrimony's importance; in America, they have evolved into heartfelt messages of love from close friends and family. 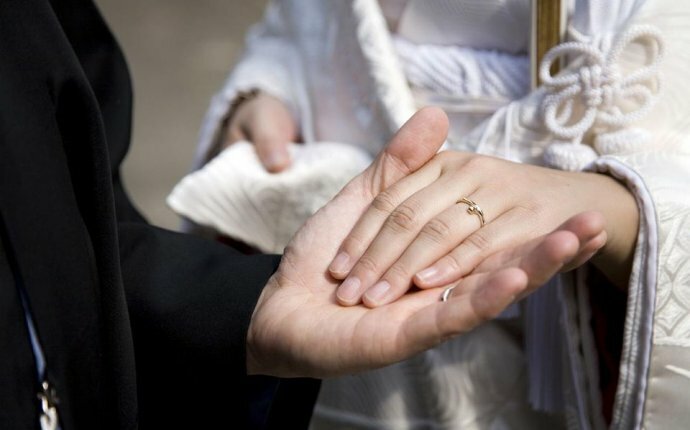 In Japan, brides spend $30 to $80 on "favors" for their guests. In America, favors are more likely to be small tokens - a few folded origami cranes (the bird that symbolizes a long, contented married life) or a lace bag of sweet almonds.